transcosmos inc. (Headquarters: Tokyo, Japan; President and COO: Masataka Okuda) will release its proprietary training curriculum, “Access Log Analyst Development Course,” with the aim to assist clients in developing internal talent who can analyze access logs, website, and smartphone browsing history. Taking the first step towards the utilization of data at their front-line operations, transcosmos will release this course to the public in January 2019, with the goal of implementing the course for 30 companies by the end of 2019. Today, despite the fact that many companies have implemented Google Analytics, Adobe Analytics, and other major log collector & analyzer tools, most companies face enduring challenges that include “cannot make the most of the tools,” “have know-how to use the tools yet cannot actually perform any analysis with them,” and more. On the flip side, given the current trend towards the so-called “democratization of data science,” a growing number of businesses are eager to develop their employees’ skills in order to have internal talent who can analyze access logs so that they can start utilizing the data at front-line operations, at a lower cost, and at a greater speed. To date, transcosmos has been performing website analysis, operations and updates for various clients, and incorporated the acquired know-how into its internal programs for developing analysts. 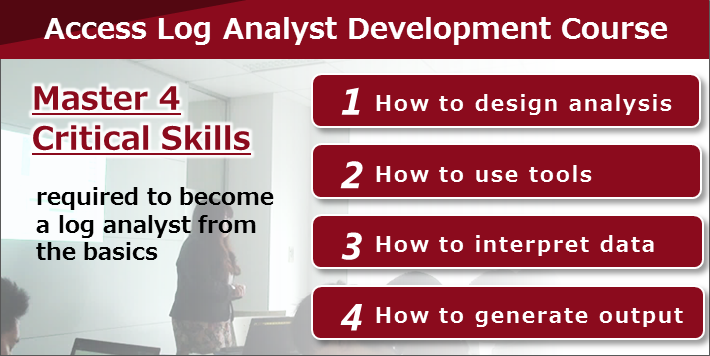 Now, transcosmos has re-organized and developed its proprietary “Access Log Analyst Development Course” in order to offer the course to clients. Its curriculum covers not only ways to use data collector and analyzer tools but also 4 critical skills required for log analysts from the basics, namely, how to design analysis, how to use the tools, how to read and interpret output data, and how to generate a report from output. transcosmos will release the “Access Log Analyst Development Course” to clients that already have Google Analytics or Adobe Analytics in place. *The course is available to companies that have implemented Google Analytics or Adobe Analytics through agencies other than transcosmos. All 3 plans cover the basics, so beginners who don’t have basic knowledge of access log or have never used the tools are welcome to take the course. transcosmos provides the best plan that suits each client’s future goals such as ultimate skills that clients want their employees to master, how learners want to utilize the access log to their tasks, etc. The course uses real-world data that has been collected and accumulated by clients, not processed data for training, which allows learners to have a better idea of how they could utilize the data in the future. Moreover, the course is designed for small-group training, limited to only 10 employees per class, per each client, which prevents variances in the level of learning. *In principle, transcosmos holds the course multiple times if the number of learners exceeds 10. Please note that in such cases, course fees are subject to change. transcosmos arranges a flexible training timetable that fits to learners’ schedules. Clients can save both resources to prepare training PCs and time by holding the course at their offices. *PCs and venues for the course can be arranged by transcosmos. Please note that in such cases, course fees are subject to change. transcosmos continues to support clients’ digital transformation and the “democratization of data science” by providing various services that leverage its know-how in analyzing data including access log data.